We are thrilled to now be offering Capay Mills' fresh and delicious heirloom flours in our online Farm Stand. There's an heirloom-grain resurgence taking place in local communities to reclaim the flavor of wheat. Once upon a time, flour used to be milled fresh to order, and there was a multitude of tastes and textures to choose from. Today, the flour we find in the grocery stores can be stale and lacking in taste and sustenance. 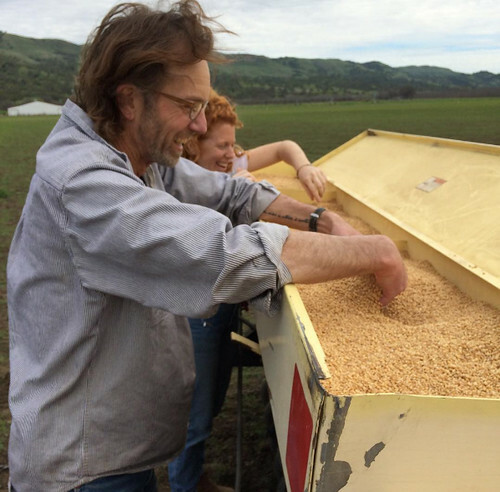 Lucky for us, we didn't have to look further than our own Capay Valley community to find some of the most delicious heirloom flours on the market. David Kaisel, flour miller and local wheat expert, launched Capay Mills in 2014 to develop markets and provide infrastructure for re-introducing small-scale heritage grain production. 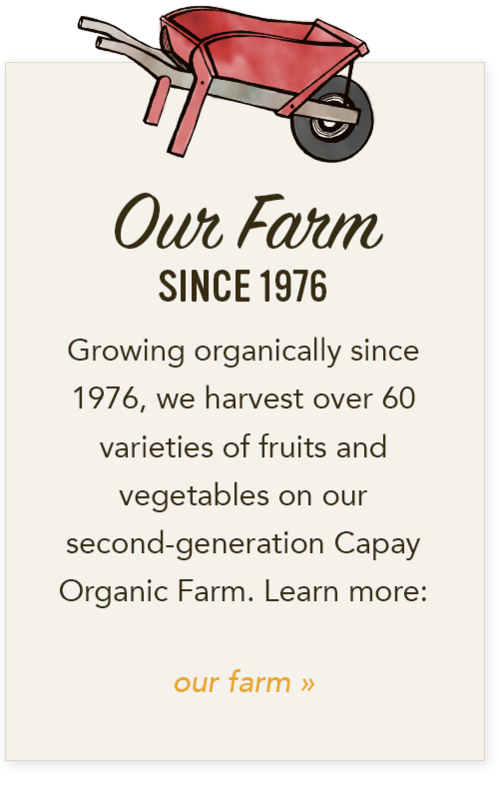 Drawing inspiration from traditional community farming practices, Capay Mills focuses on increasing the availability of traditional grain varieties, fresh stone-milled flour and fostering collaborative relationships between growers, millers, bakers and chefs. 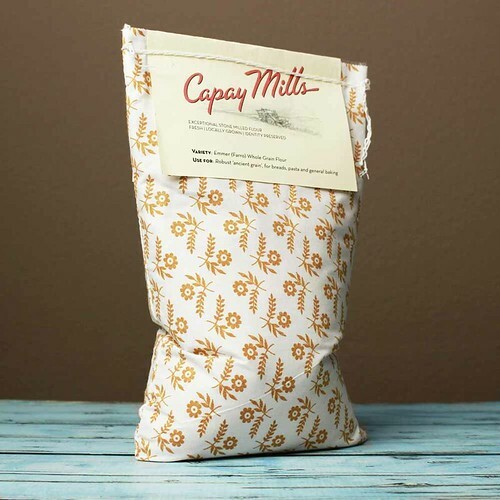 With an emphasis on 100% whole grain flour, Capay Mills sources sustainably grown local grain and mills to order using an Italian stone mill, the old-fashioned way. Since many of us on the farm are still experimenting with heirloom flour, we decided to pick one (we chose emmer) and whip up a batch of Apple Breakfast Muffins to pass around the office. I have to say, they were quite the success, and I definitely enjoyed the unique flavor. This flour produces a robust dark red/brown grain, high in fiber and minerals, which adds to its rich earthy flavor, texture and deep color. It is also used for rustic pastas, that may be better tolerated by those sensitive to modern wheat flours. Emmer's relatively low gluten make it a great choice for pie crusts, gallettes, scones or hearty biscuits. Give it a try and share your creations with us. 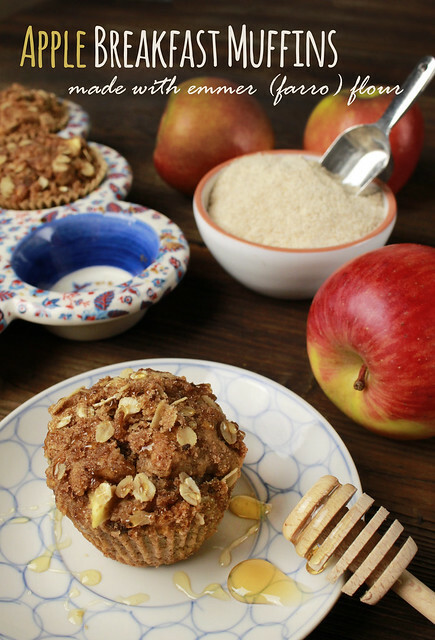 These apple breakfast muffins are made with emmer (farro) flour, delicious seasonal apples and a touch of maple syrup, which will have you dreaming of a crisp fall morning and a hot cup of coffee. Preheat the oven to 350 degrees F and line a muffin tin with papers. In a large bowl, whisk together the two flours, baking powder and baking soda, cinnamon and salt. In a separate bowl, whisk together the eggs, yogurt, apple sauce, maple syrup, sugar and oil. Pour the wet ingredients into the dry ingredients and stir just until combined (the mixture is thick and a bit more dry than a typical muffin mix). Spoon batter into each muffin cup so cups are about three-fourths full. In a small bowl, mix together the topping ingredients with your fingertips. Sprinkle a little of the topping ingredients over each muffin, then bake for about 20-23 minutes or until firm to the touch. Enjoy! 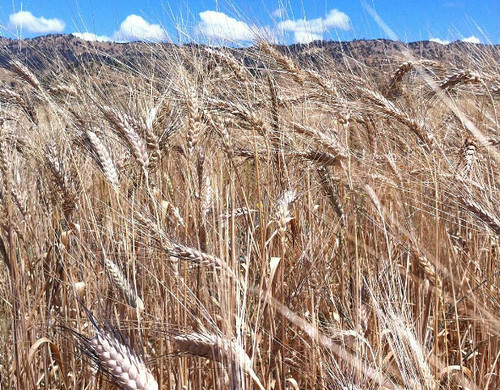 Lead photo of heirloom wheat growing at Capay Mills provided by Capay Mills. 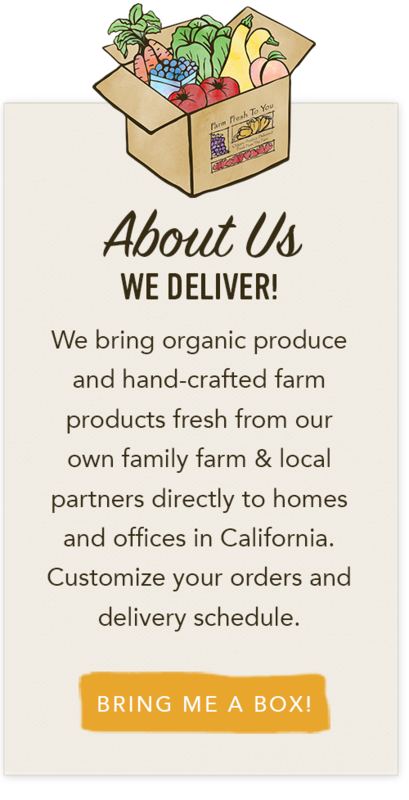 How To Add Capay Mills flour To Your Delivery: CSA members - head on over to our online Farm Stand Market to customize your upcoming delivery. The Market is open from noon on Thursday until 10 am, 2 days before your scheduled delivery day. After you confirm your produce items, click the orange button "Confirm and Continue To Other Farm Products" to add the products to your delivery. My mother planted a mix of fruit trees in an orchard 15 years ago to meet the needs of the farmers market stand and Farm Fresh To You. It is a mix of many different peaches, mandarin oranges, plums, apples and pears. I have lost the record that shows what varieties she actually planted, so the subtleties of the orchard are a bit of a mystery to me. We are in the thick of summer, which means fall is just around the corner for a farmer. It feels strange to be planting fall vegetables before the summer harvest has fully ramped up, but the consequences of assuming the heat will continue for three more weeks than average is not safe. The transplanting crew tucked in the first baby chard, kale, leek, cabbage and fennel plants. It can be safe to assume that in sixty days some of those crops will be ready – it will be September by then. The Perfect Egg - Cookbook Giveaway & Recipes! 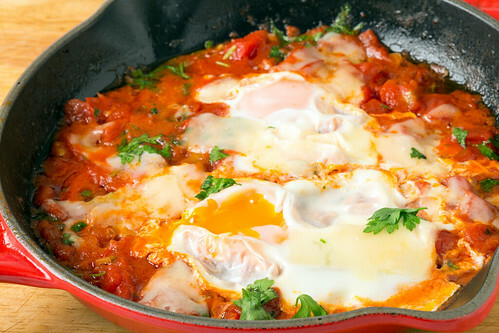 There is no doubt about it, eggs are a super-star food: protein-rich, versatile and a delicious crowd pleaser. 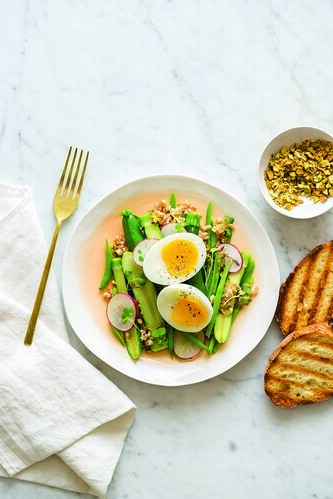 Teri Lyn Fisher and Jenny Park, authors of the Spoon Fork Bacon blog, have teamed up to create The Perfect Egg: A Fresh Take on Recipes for Morning, Noon, and Night. Most of us always have eggs on hand, but beyond a quick scramble or a team player in your cake mix, we aren’t always sure what to cook with them. So if you are looking to expand your egg knowledge and culinary palette, this book is for you. And let me just say, the photographs are lovely. For anyone overwhelmed by the plethora of egg-based sauces and condiments, there’s a side-by-side comparison to answer any lingering questions. Similarly, the introductory “101” section covers all the basics (cooking techniques, storage, etc.) that you always think you know but, in actuality, aren’t really sure of. The authors also included many basic recipes for pasta doughs and breads as well as new dishes that you may not be familiar with like gyeran bbang, chawanmushi and foi thong. The Perfect Egg is a good book for people of all cooking levels. If you aren’t comfortable with the harder recipes, the more basic recipes will get you started and help you feel more comfortable with all the egg’s many uses. To wet your appetite, we have included two recipes below to get you started on your next creative egg concoction while you jump online to order your copy. We're so excited to have a copy of this egg-celent book to give away to one of you! To win a copy of The Perfect Egg, simply leave a comment below answering this question by Monday, August 1, 2016 (one entry per person please). How do you like to prepare your eggs? Why? No purchase required. Limit one entry per person, please. Entries will close on Monday, August 1, 2016 at 3:00 pm. Winner is chosen by Random Number Generator and announced on our blog on Tuesday, August 2, 2016. "My favorite dish when I need some comfort is milk toast. It is something my Grandmother made us when we were little and it is basically an egg poached in milk and everything poured over buttered toast cut into slices. It is really good if you are feeling under the weather or if you just want something comforting. Plus I see and hear my Grandmother whenever I make it. It is funny how some foods are associated so closely with someone in your life. She has been gone almost 30 years now and I still think of her every time I make a milk toast." Place all the vinaigrette ingredients, except the olive oil, into a small mixing bowl and whisk together. While whisking, pour in the oil in a slow and steady stream. Continue to whisk until the mixture has emulsified. Taste, adjust the seasoning if needed, and set aside until ready to use. Pour the farro and stock into a medium pot and bring to a boil. Once the stock has come to a boil, reduce heat to medium and simmer for 30 to 40 minutes or until most of the liquid has been absorbed and the grains have softened and split. Drain any remaining liquid and allow the farro to cool, about 1 hour. Fill a small pot with water and bring to a boil. Once water has boiled, generously season with salt and drop in the zucchini and French green beans. Blanch vegetables for 2 to 3 minutes and then transfer them to an ice bath to ensure the vegetables retain some texture. Once cooled, drain the vegetables and place into a large mixing bowl with the cooked farro and sliced radishes. Drizzle half of the vinaigrette over the mixture and toss together (you can reserve the remaining vinaigrette for another use). Top the salad with microgreens, crushed pistachios, and grated lemon zest, and serve. TIP: To cool farro quickly, spread onto a sheet pan, in a thin layer, and place in the refrigerator for about 15 minutes. Peel and chop the eggs and place in a bowl. Add the pickle, mayonnaise, mustard, chives, vinegar, salt, and pepper and mix well. 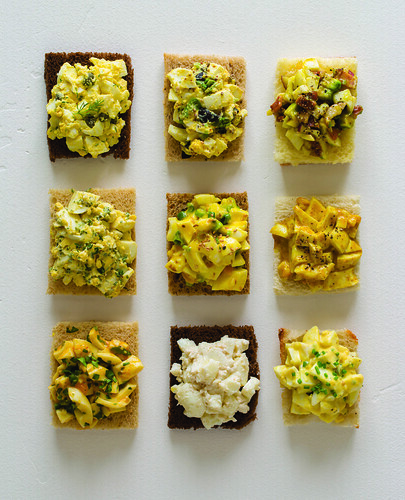 Divide the egg salad evenly among 4 toast slices and top with the remaining 4 toast slices. Press gently and then cut each sandwich in half. CAPER & DILL: Stir 1 tablespoon diced capers and 11 ⁄2 teaspoons minced fresh dill into the egg mixture. OLIVE & WHOLE-GRAIN MUSTARD: Replace the Dijon mustard with 11 ⁄2 tablespoons whole-grain mustard and stir 11 ⁄2 tablespoons chopped Castelvetrano olives and 1 tablespoon chopped black olives into the egg mixture. BACON, AVOCADO & RED ONION: Replace the hard-boiled eggs with soft-boiled eggs. Omit the chives and stir 21 ⁄2 tablespoons crumbled cooked bacon; 1 ⁄4 avocado, peeled and diced; and 11 ⁄2 tablespoons minced red onion into the egg mixture. FOUR HERB: Reduce the chives to 1 teaspoon. Stir 1 teaspoon each minced fresh thyme, oregano, and sage into the egg mixture. GREEN ONION & SESAME: Replace the hard-boiled eggs with soft-boiled eggs. Omit the mustard and chives and stir 1 teaspoon toasted sesame oil; 1 teaspoon sesame seeds, toasted; and 11 ⁄2 green onions, white and green parts, thinly sliced, into the egg mixture. CURRY: Replace the hard-boiled eggs with soft-boiled eggs. Omit the mustard and chives and stir 2 teaspoons curry powder and 1 ⁄2 teaspoon ground cumin into the egg mixture. JALAPEÑO & CILANTRO: Stir 2 tablespoons diced, seeded jalapeño chile and 1 tablespoon minced fresh cilantro into the egg mixture. EGG WHITE: Omit all of the egg yolks, add 2 additional hard-boiled egg whites, and replace the black pepper with white pepper. 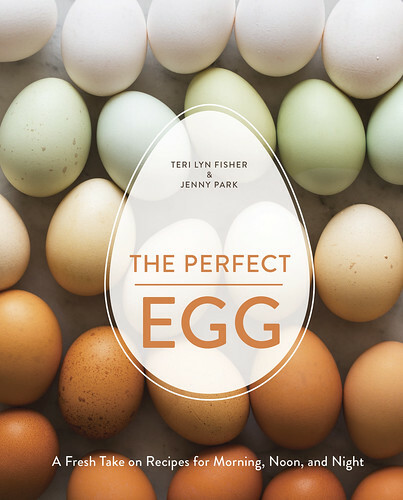 Reprinted with permission from The Perfect Egg, by Teri Lyn Fisher and Jenny Park, copyright © 2015, published by Ten Speed Press, an imprint of Penguin Random House LLC. The sun has baked the hills into their beautiful, golden color that will last for the next few months. The days have been hot, which is great for our tomatoes, but not so pleasant for people. Lots of water is being consumed, and the heat of the day results in a slower, but still steady pace, for all farm jobs. 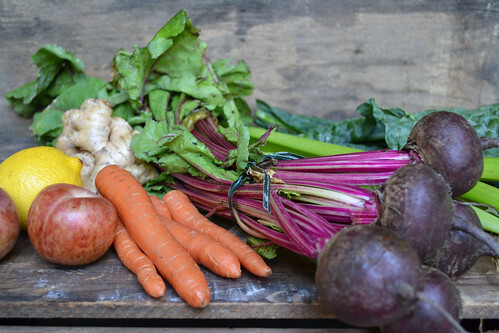 The health benefits of root vegetables can be attributed to their richness in nutrients, vitamins and minerals and organic compounds like carotenoids, dietary fiber and flavonoids. Drinking fresh juices are a great way to get in your daily recommended servings of fruit and vegetables, strengthen your immune system, detoxify your body and improve digestion. Another bonus to drinking fresh juices - they taste great! Blender/Food Processor Directions: Chop the beets, carrots and celery into small pieces and blend with a little bit of water. Chop the kale leaves and pluots and process until smooth. Add the lemon juice and grate approximately a tablespoon of ginger into the juice. 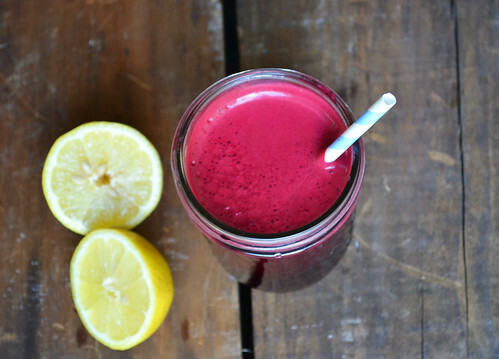 Juicer Directions: Feed whole small beets or large cut-up beets down the chute one at a time until processed. Add the carrots, celery, kale leaves and pluots one at a time until processed. Process the piece of ginger. Mix the lemon juice in with the processed juice. 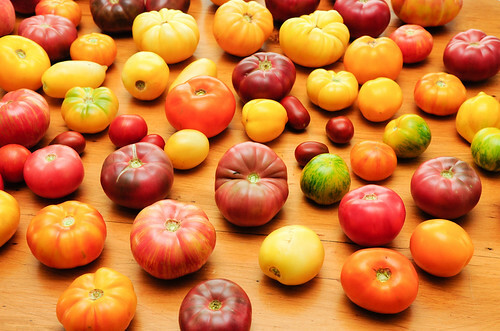 There's something spectacular about heirloom tomatoes. We hear so many of you say that heirloom tomatoes taste as they should - like a real tomato, not mealy and flavorless. This dish is so incredible, you'll be finding excuses to make it again and again and again. Enjoy it as an amazing breakfast, lunch or dinner. Mix it up each time you prepare it by add other ingredients like spinach or kale, sweet or hot peppers, or sliced avocado. Serve with a hearty slice of bread to sop up all of the deliciousness. Need to use up day-old bread? 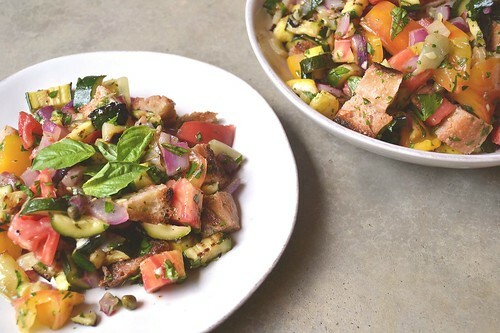 Grill it up with some heirloom tomatoes and a few other favorite summer vegetables, then toss them all together, lightly dress, and enjoy this fantastic Panzanella - a.k.a. "bread salad". 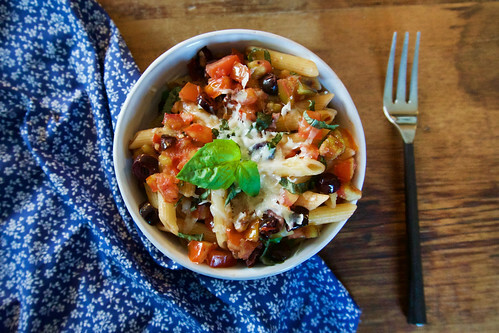 This summery pasta dish will not disappoint! The earthy and sweet flavors of the heirloom tomatoes and fresh basil are the highlight of this simple and easy to make dish. Hope you head on over to our online Farm Stand Market and add heirloom tomatoes to your delivery. Remember, you can add and make changes to your box contents by 10 a.m. 2 days prior to your scheduled delivery. Not part of our farm family? Find out if we deliver to your neighborhood. What to do with farm ground for the three years after it has been farmed with chemicals, but before it is certified organic has been a question I have toiled with for a decade now. When we purchase conventional land and work to convert it to organic farmland, the plan has been to grow something that will both enrich the soil and prevent the weeds from taking over in the most economical way possible.